We are parents too and know only too well how much planning goes into a holiday with small children. The more child-friendly the environment, the easier it is to enjoy time away with a baby or toddler. At ROBINSON, our goal is to take all the stress out of your family vacation. That's why many of our CLUBS offer infant packs with everything baby needs on vacation: wood or travel cribs, children's buggies (at the beach resorts), baby bath, bath towel, play mat, changing mat, potty seat, diaper pail, bottle heater. The ROBY BABY SET is available in the ROBINSON CLUBS: CLUB AGADIR, Morocco (summer and winter), CLUB AMADÉ, Austria (summer and winter), CLUB APULIA, Italy (summer), CLUB CALA SERENA, Spain (summer), CLUB DAIDALOS, Greece (summer), CLUB DJERBA BAHIYA, Tunisia (summer and winter), CLUB ESQUINZO PLAYA, Spain (summer and winter), CLUB FLEESENSEE, Germany (summer and winter), CLUB LANDSKRON, Austria (summer and winter), CLUB PAMFILYA, Turkey (summer), CLUB QUINTA DA RIA, Portugal (summer and winter) and CLUB SCHLANITZEN ALM, Austria (summer and winter). At selected CLUBS you can purchase baby food and other baby items, in case you leave anything at home. At most of the ROBINSON CLUBS you can spend quality time with your child indoors and outdoors in specially designed environments to stimulate the imagination: play areas, open-air lawns, and wading pools offer the perfect environment for small adventurers to enjoy big voyages of discovery — all within safe view. An on-site children's nurse is also available if needed. Breathe easy and enjoy your family vacation, because a happy parent makes for a happy child! In addition to our day-time childcare service, we are also happy to provide you with a babysitter outside ROBY BABY CLUB opening hours. In addition to our experienced ROBY BABY CLUB ROBINS, there are also a number of female employees available to babysit. The service costs €12 an hour for one child. Contact us at ROBY BABY CLUB or at reception to let us know your babysitting needs. The earlier you inform us of your requirements, the greater the chance of finding a suitable babysitter. Looking for a vacation with baby care included? Look no further than our ROBY Infant Weeks. Our Baby ROBINS at CLUBS ESQUINZO PLAYA and FLEESENSEE offer lovingly provided childcare (additional charge, pre-booking required) during set hours for children as young as one year old. The cutoff date is the child's birthday. Colorfully designed play areas provide the perfect environment for infants to play with building blocks and balls or to watch mesmerizing finger puppet plays, while mom and dad enjoy a little peace and quiet. 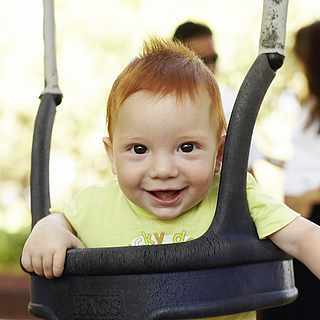 The ROBY BABY CLUB is the right club for our youngest guests. AT CLUB APULIA and from summer 2016 at CLUB PAMFILYA babies aged 1 to 24 months can be looked after by caring and qualified ROBINS during set hours (additional charge, limited number of places). The childcare is available at CLUB APULIA at 6 days a week (excluding Saturday) from 9:30 am to 12:30 pm and from 3:30 pm to 6:30 pm at CLUB APULIA. At CLUB PAMFILYA childcare is available 7 days a week from 9:30 am to 12:30 pm and from 3:30 pm to 6:30 pm. Please register your children for the ROBY BABY CLUB directly with our club at frontoffice.apulia@robinson.de or frontoffice.pamfilya@robinson.de. A detailed record of our young guests' important information, such as name, age, allergies, and special requirements, will be kept there. Please visit reception during ROBY BABY CLUB’S closing hours to inquire about available places. We will then reserve a place for you with our childcare service — as long as there are places available. Please also provide adequate sun protection and bring your child to the childcare service freshly changed. Our prestigious cooperation partners guarantee exciting and age-appropriate events and programs for our youngest guests. And you can rest safe in the knowledge that all ROBINSON children's play areas undergo an annual safety assessment by an independent expert.